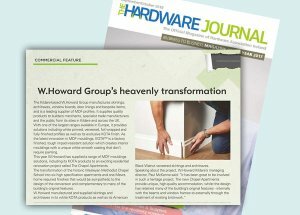 The Hardware Journal of Ireland have recently published a great piece on W.Howard's involvement in a unique heritage renovation project. The Chapel apartments, a redevelopment of a historic Wesleyan Methodist Chapel School, have used our skirtings and architraves in white KOTA™ as well as our American Black Walnut veneered. Read more about the renovation project in our NEWS section.